This was one of the last buildings designed by Nechodoma before his untimely death in a 1928 auto accident. In 1926 the Puerto Rican branch of the Federal Land Bank of Baltimore commissioned him to design this bank building, located on a prominent site on top of the old city’s fortress walls. 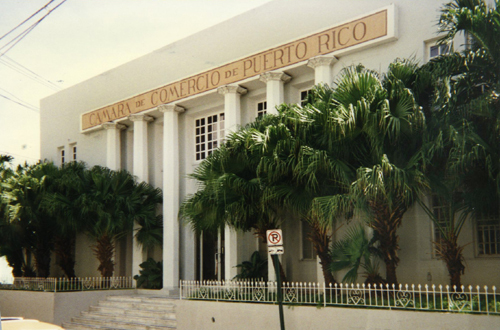 In 1937 the bank sold the building and property to the Puerto Rican Chamber of Commerce, which still occupies it. The six two-story octagonal columns frame the recessed entrance and give the facade of the building a stately and solid appearance commensurate with its banking purpose. 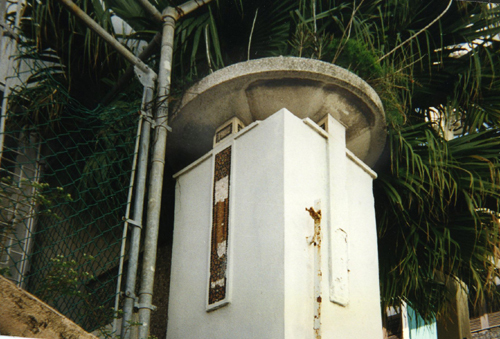 The idiosyncratic capitals support a protruding horizontal beam emblazoned with the name of the occupant. Originally the exterior of the building displayed extensive and presumably colorful mosaics, which now have been largely painted over. A distinctly Prairie School urn on the terrace beside the building gives a hint of the more elaborate detail that graced the original building. Photos by Wayne W. Wood. • Thomas S. Marvel. : Antonin Nechodoma: The Prairie School in the Caribbean. Gainesville, Florida: University Press of Florida, 1994.